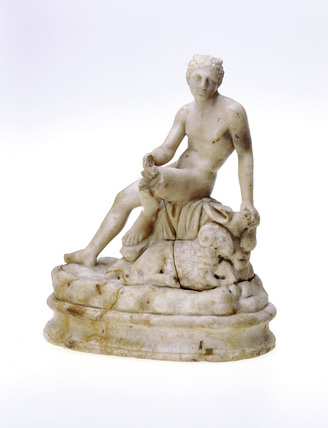 From: Museum of London: Statue of Mercury with sheep. Found in 1954 at the east end of the temple of Mithras discovered under Bucklersbury House EC4 London. Mercury escorted the dead from Earth to paradise. He is seated on a rock holding a money bag, his symbol as patron of commerce. He is accompanied by a ram and a tortoise. The ram is a symbol of fertility, the tortoises, whose shells were used to make lyres, may illustrate the eternal happiness or the afterlife as promised by Mithraism. A small marble statuette. Naked Mercury sitting on a rock. In the hair of his head are the stumps of wings, in his l.h. is a purse, beside the forefeet of a ram, which is lying down at the god's feet, is a tortoise (ILN, 636).